Heading into the weekend, it appeared that four girls would be battling it out for the individual championship with Bolivar senior Kelie Henderson leading the way. Henderson was the 2016 runner-up behind Marshfield's Tabitha Weber and appeared poised to grab her first cross country title in this one. She came in with the fifth fastest 5K of any girl in the entire state and 18 seconds ahead of the next closest in Class 3. 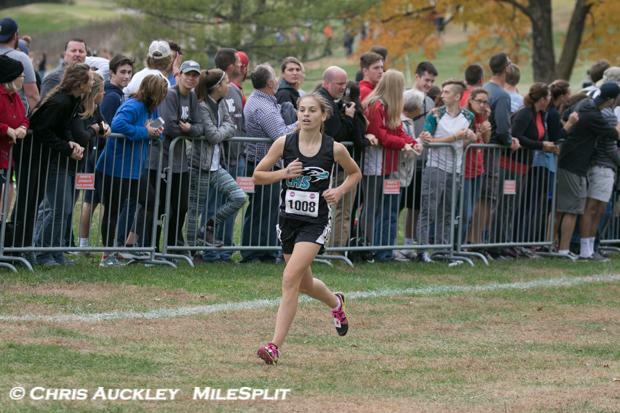 Her 18:23.67 was ran at the COC-Small Schools Championships in early October. Henderson pulled the pack through the mile in 5:45 alongside John Burroughs freshman Kylie Goldfarb and Christian (O'Fallon) freshman Mercedes Schroer, with Herculaneum junior Nautica Stricklin just two seconds behind. As they rolled through two miles not much slower than they had come through one mile, Henderson had the slight edge over Schroer with Goldfarb now two seconds back and Stricklin getting picked up by her teammate Emily Enghauser and Notre Dame Cape Girardeau senior Alaina Baumgart about 15 seconds behind the leaders. 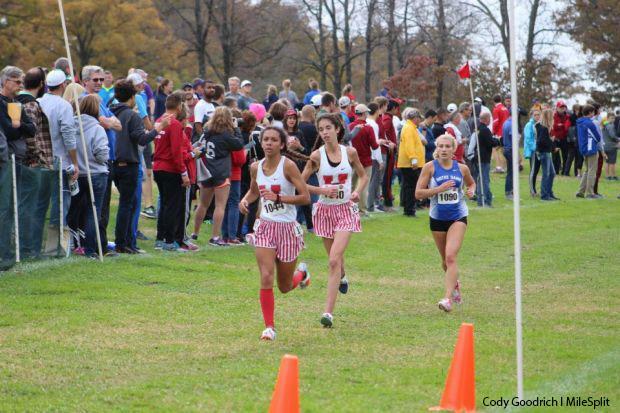 Eastern Missouri, unlike the other races on the day, was dominating this race with six of the top seven girls hailing from Southeast Missouri or the St. Louis Metro area. Henderson appeared ready to throw in her kick and separate, and she did off the top of Firehouse Hill. She had gained about 5-8 seconds of separation as they came toward the final quarter mile, but that is when everything turned upside down. As she hit the blue 3 Mile pad and heard the beeps signalling her arrival to the last 188 meters of the race, Henderson had her eyes on the title. The senior would become Bolivar's first ever state champion in cross country and cross the line right on the bubble of a top 10 all-time state 5K in Class 3. She came through 5 seconds ahead of Goldfarb, but then the wheels fell off. Henderson hit the deck after the curve and fell straight down. This was not a quick fall and then get up situation, this was a fall that would result in a six-and-a-half minute struggle to get 150 meters to the finish line. 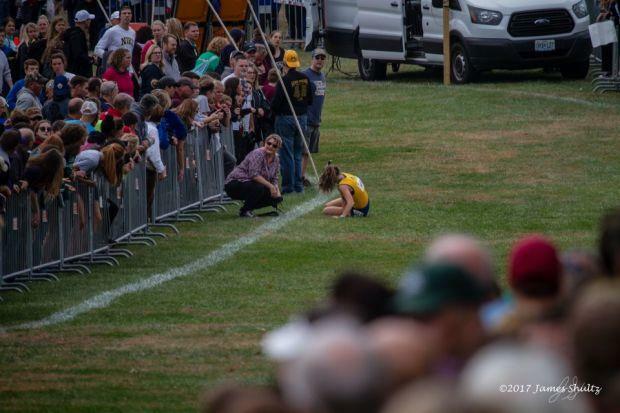 It was a display of physical exhaustion unseen in really any other high school sport and, even though she had crossed the 3 mile mark in 18:20, she would not cross the finish line until 24:41. Her third mile and final stretch were both 6:20. "She ran the smartest race I have ever seen her run," said Coach Bandy. "She was patient and ran a relaxed 2 miles. She followed our race plan perfectly. I saw her at 600 to go and she looked like she did at every race I have ever seen her run... I stayed at the 600 mark to encourage the rest of our girls in. I lost sight of her and did not even know she went down until several minutes later." Bandy continued, "We really do not know what happened. She said her body just shut off. All she could think about was trying to finish but her body would not respond. She is the most driven and dedicated runner I have ever coached. For her right now, the biggest disappointment is her feeling that she let her girls down... She is 100% devoted to her girls... She is one of a kind." As a result, Goldfarb, who had crossed 5 seconds behind, flew past and up the final straightaway to take the individual championship in her first attempt. The freshman ran her second fastest time of the season, 19:00.54, after having ran her personal best the race prior in District 3 - 18:41.12. 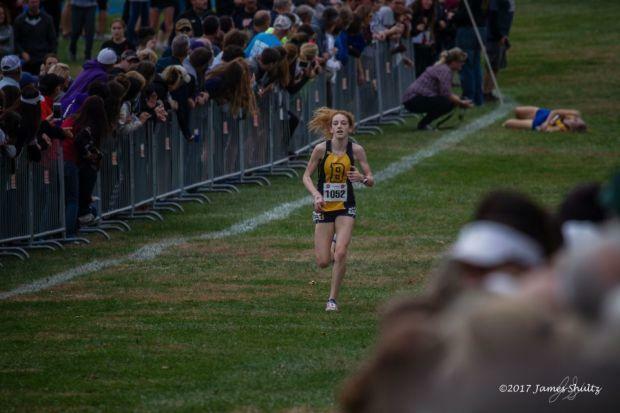 She came into the season with 2:20 and 4:51 (1500) PRs as an 8th grader and flew low on the radar before her 2nd place finish in the Forest Park Gold Division race. 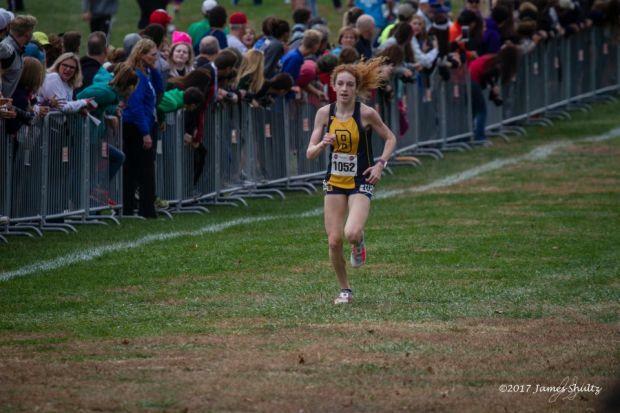 She finished outside of the top 2 in only one race this season (Edwardsville) and won her last 3. Kylie Goldfarb now joins Brandon Miller among the current greats at John Burroughs and we expect this to catapult Goldfarb into an incredible career. In second was another freshman as Schroer came across 29 seconds behind Goldfarb. A soccer specialist, the other freshman phenom in Class 3 has been consistently between 19:10-19:30 all season, but was unable to finish the job for the state championship on Saturday. A St. Charles County resident, Schroer noted to us that she would actually be at Francis Howell if she was not at Christian High, adding another incredible talent from the West O'Fallon/Dardenne Prairie/Southwest StC County area. "I don't really remember much of the race," said Schroer after receiving her medal, "I just tried my hardest and treated it like any other meet." 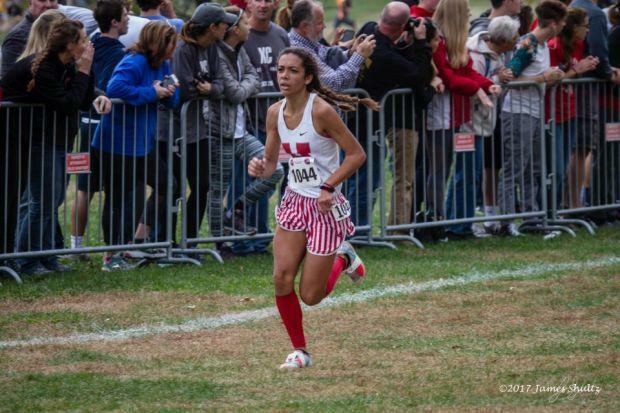 We will see her part time on the track as she splits time with the soccer team, but after running 12:02 on the course for her first two miles on Saturday, we could be seeing another incredible career unfolding before our eyes. In third, grabbing her third straight top 4 finish, was Stricklin as she was able to pull away from the rest of the field for a 19:34.84 finish. 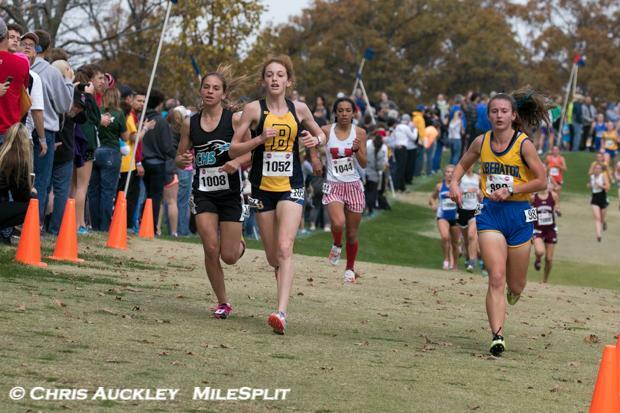 After a 5th place finish in Class 2 as a freshman, Stricklin executed a flawless transition to Class 3 in 2016, taking 4th, and nearly took 4th again this year if it was not for the circumstances in front of her. The junior will be back for more next year, but will have much competition as 7 of the top 10 girls will be returning in 2017 (more on that later). 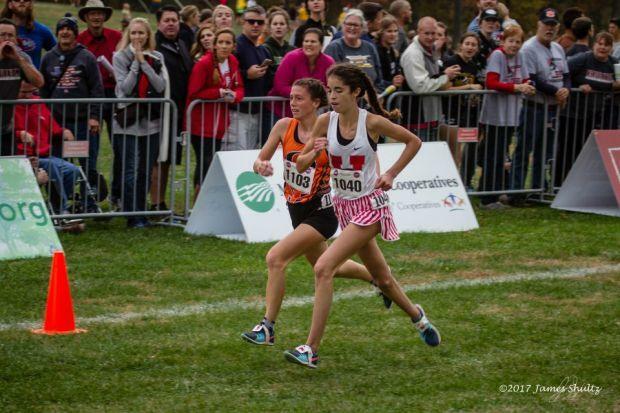 Going stride-for-stride in the final 50 meters were Owensville sophomore Sophie Ashner and Herky's Enghauser. Ashner used a 6:37 3rd mile to push from 7th to 5th and then eventually outkick Enghauser right at the end. Ashner made a 10 place improvement from her freshman year and Enghauser earned her second career top 5 finish, her first in Class 3.